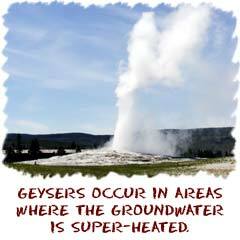 Groundwater is water that is under the ground. Okay. You're done with the tutorial. If you want more, you should know that groundwater is extremely important. Civilization gets most of its water from groundwater sources. There is more groundwater under the surface of the Earth than in all the lakes and streams put together. Unfortunately, groundwater is also polluted more than any other source of fresh water. Groundwater starts life on the surface. When it rains and the water moves through the soil, it's called infiltration. The area near the surface of the soil is called the zone of aeration. There are spaces between the dirt and rocks that allow the water to flow through easily. Eventually the water makes it to rocks where scientists say it percolates deeper into the Earth (yes, like a coffee pot). The area where the water winds up is called the zone of saturation. Different from the soil, the zone of saturation has very small spaces between the rocks. The spaces are so small they may even be the size of large molecules. When the water can go no deeper, it creates an aquifer. An aquifer is an underground reservoir inside the rocks. When a farmer digs a well, they are digging into an underground aquifer. After they drill to the water table (the highest level of the aquifer), they are able to pump the water to the surface. As farmers pump too much water out of an aquifer, they find that the water table dips in that specific area. That dip in the water table is called a cone of depression. We're talking about humans pumping water out of an aquifer. There are two kinds of aquifers. One type you need to pump the water out of and another type in which the water is under pressure and moves towards the surface by itself. The pumping type is called unconfined. It has a layer of permeable (water can pass through) rock on top and nonpermeable (nothing can pass through) rock on the bottom. The water does not build up any pressure because it can expand and contract. The second type of aquifer is confined and called pressurized. It is sandwiched between two nonpermeable layers of rock. There is nowhere for the water to go when new water comes in and the pressure builds. The water eventually pushes up to the surface and creates springs and a type of freshwater called artesian water.